This cartoon by Schrank from The Independent uses a visual metaphor to comment on the situation in Syria, where opposition groups are being brutally repressed by the regime of President Bashar al-Assad. 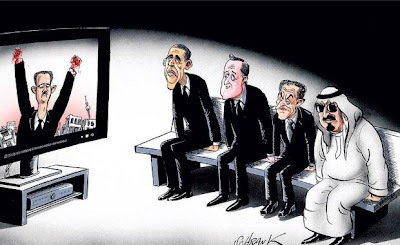 Barack Obama, David Cameron, Nicolas Sarkozy, and King Abdullah of Saudi Arabia, are shown sitting on their hands as they watch TV images of Assad raising his blood-covered fists. If you sit on your hands, you do nothing about a problem or a situation that needs dealing with. • Every day the crisis worsens and yet the government seems content to sit on its hands.